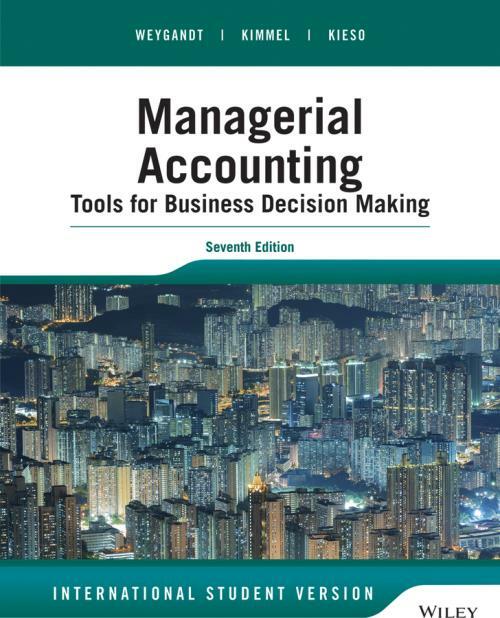 Managerial Accounting: Tools for Business Decision Making, 7th Edition by Weygandt, Kimmel, and Kieso provides students with a clear introduction to fundamental managerial accounting concepts. The Seventh Edition helps students get the most out of their accounting course by making practice simple. Both in the print text and online in WileyPLUS with ORION new opportunities for self–guided practice allow students to check their knowledge of accounting concepts, skills, and problem solving techniques and receive personalized feedback at the question, learning objective, and course level. Newly streamlined learning objectives help students use their study time efficiently by creating a clear connections between the reading and video content, and the practice, homework, and assessments questions. Weygandt, Managerial Accounting is a best–selling program ideal for a one semester undergraduate Managerial Accounting Course that focuses on teaching students the core concepts.